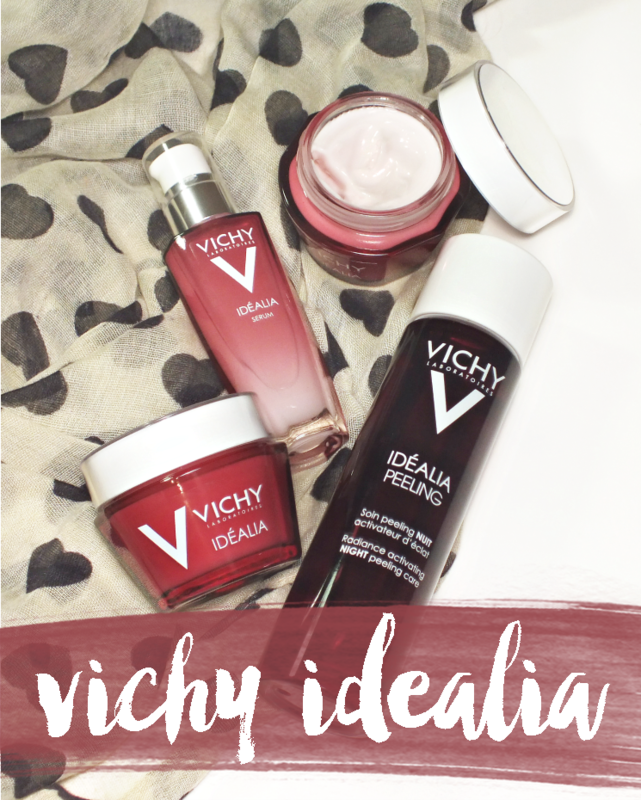 The new superstar of the range is the Idealia Peeling Night Radiance Activating Night Peeling Care. Housed in a dark raspberry hued, heavy glass bottle, the syrupy liquid is applied to skin like toner (aka on a cotton round) after cleansing. Containing glycolic acid, blueberry polyphenols, and fermented black tea extract, it works to remove excess dead skin cells and stimulate skin regeneration to give dull skin its glow back. With continued use it lightens dark spots and acne scars while also diminishing fine lines. I found it only took a few uses for this to show a difference in my skin, which looks dull quite easily. For a gentle peel, this is very effective when used daily and gives that smooth, radiant looking skin we're all looking for. 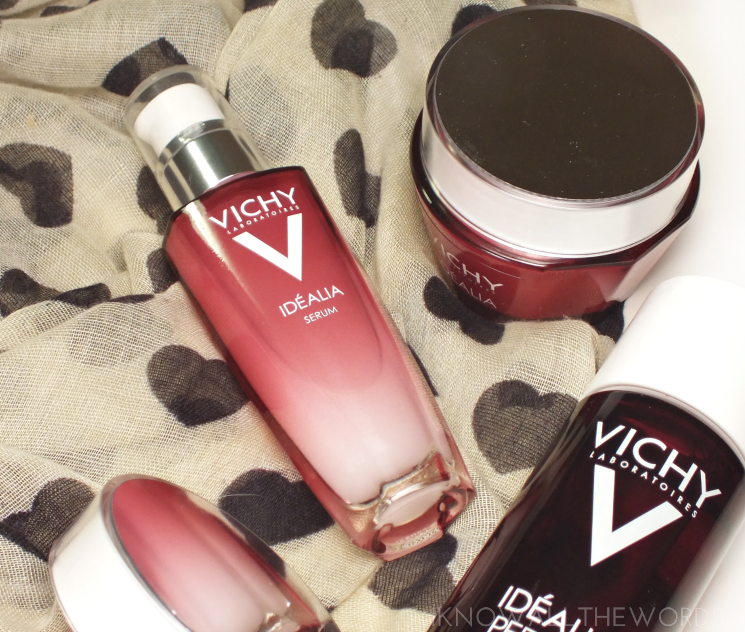 I am a major fan of the Idealia Life Serum (I think I'm on my third or fourth bottle) so I was both hesitant and intrigued when the Idealia Radiance Boosting Serum joined the family. There really was zero need for hesitation, as this is just as great (maybe even better?) Formulated with AOX flavonoids and licorice root extract, it woks to transition skin to a smoother, glowing thing of greatness with the first signs being visible within the first eight days of use. The lightweight formula is hydrating upon application and is absorbed really quickly. Not only does this feel great at application, I have noticed brighter skin with a softer, more even looking complexion. 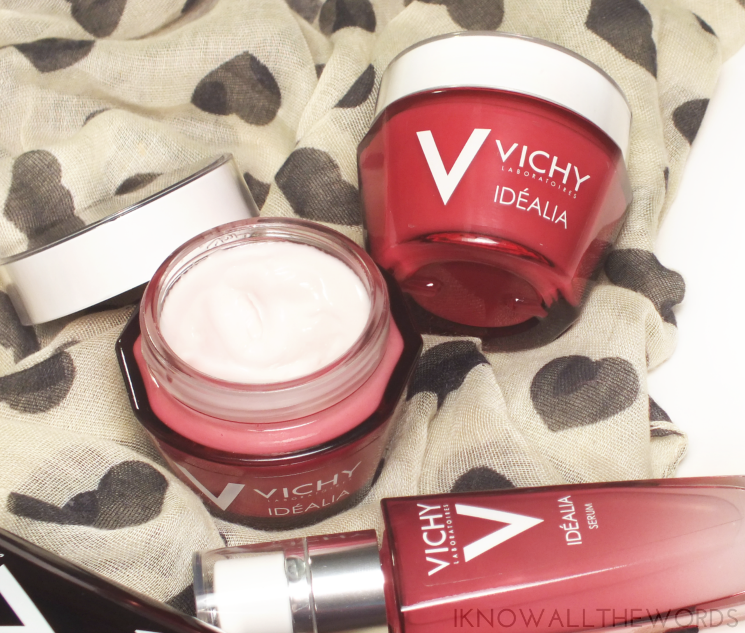 Of course, no routine is complete without moisturizer, of which there is the Idealia Smoothness & Glow Energizing Cream. The day cream is available in two options with one being suited to normal to combo skin and the other for dry skin. Featuring the main components of the range (listed somewhere above) the moisturizer works to not only hydrate (which it does remarkably well) but to also nourish skin with necessary nutrients for combating stress and reviving natural glow. This is a great day cream as it perks up tired skin while also providing a smooth base for makeup as skin not only feels smoother but pores look refined. I'll take it! Overall, great additions to the Idealia range! I highly suggest the peel, but if dull skin is something you just can't shake, you really can't miss with any of the products. What do you think? could your skin use a pick me up?